Power(s) given Floating Jump, Double Jump, automatic recovery from pits and lava. 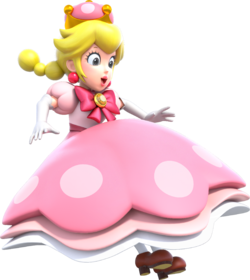 Peachette is a unique form of Toadette's that appears in New Super Mario Bros. U Deluxe, obtained by grabbing the Super Crown. In this form, she highly resembles Princess Peach. However, there are differences, notably her different dress, Toad cap-like crown, gray irises, pigtails, and Toad-like shoes. In this form, Toadette is able to Double Jump, and can also perform Peach's Floating Jump, identical to how the Flying Squirrel form functions (though she cannot wall cling). Additionally, she automatically gets boosted out of any pits she falls into. However, this works only once; if Peachette attempts this again, she will fall into the pit and lose a life as a result. This effect, and the conditions of it, also applies to lava and poisonous water. This page was last edited on March 22, 2019, at 13:29.